The Frilo.Document.Designer makes the organisation of your project documents very easy and comfortable. The FDD allows you to supplement the output of structural calculations from Frilo applications with documents in other formats from external applications. With the help of practice-oriented functions and comprehensive layout options you can combine various documents from different sources in the FDD to a single complete document on PDF basis in almost no time at all. .
You can launch external applications and edit external documents by double-clicking on the document in the FDD. 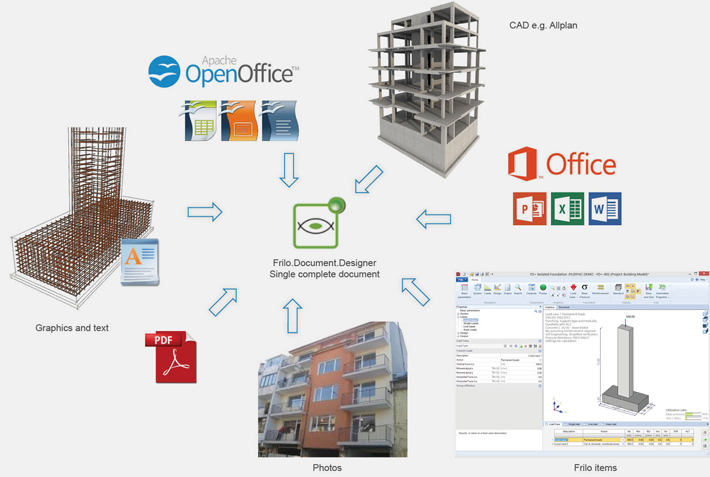 Direct integration of Frilo items, MS Office documents, Open Office documents, Graphics, PDFs, and all other formats that support background printing.